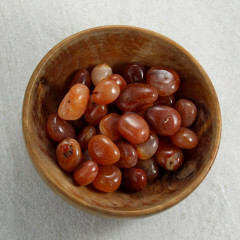 A beautiful reddy orange gemstone, comprised of Chalcedony / Quartz, and coloured by inclusions and impurities of Iron Oxide. 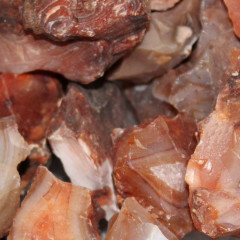 It is a semi-precious, iron-rich stone consisting of a dull red or reddish-white variety of Quartz / Chalcedony. 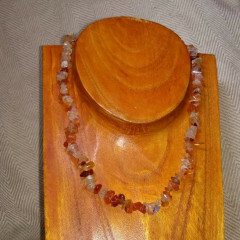 It has a glassy translucent tone reminiscent of autumn leaves or sunsets. 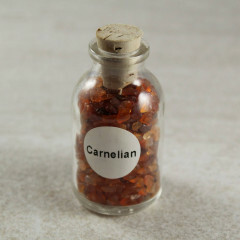 It is possible its name is derived from the Latin word for flesh, ‘caro’ or ‘carnis’, but it may also come from the word ‘cornum’, the Latin name for a type of cherry. Pieces of this stone have been found at ancient sites dating from 4000 – 5000 BC, as well as decorative pieces dated at 1800 BC. It was widely used for wax seals by the Romans, as apparently hot wax does not stick to the stone. The ancient Egyptians associated its orange hues with the fertility of the mother goddess Isis and was traditionally worn to stimulate love and desire. It can also help relieve menstrual and menopausal symptoms. 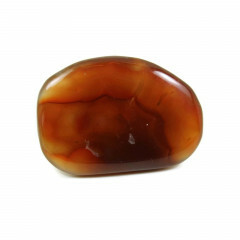 It is therefore considered to be a powerful healing stone when applied to the Sacral chakra. It’s historically the birthstone for those born under the star sign Virgo or those born in mid-autumn.